I've commented out a bunch of lines that I would like to get working in the end function, because I can't get even the other parts working. I check: balances("0x1c34d277b51ec49536fe7843e289933e0f8020ed", "0xb631fc401038e191fa38c4ff20dcce8d13eb6ebc"), I see 0: uint256: 2000000000000000000 --So far so good. If I change end to just return balances[payer][payee], I get 0. 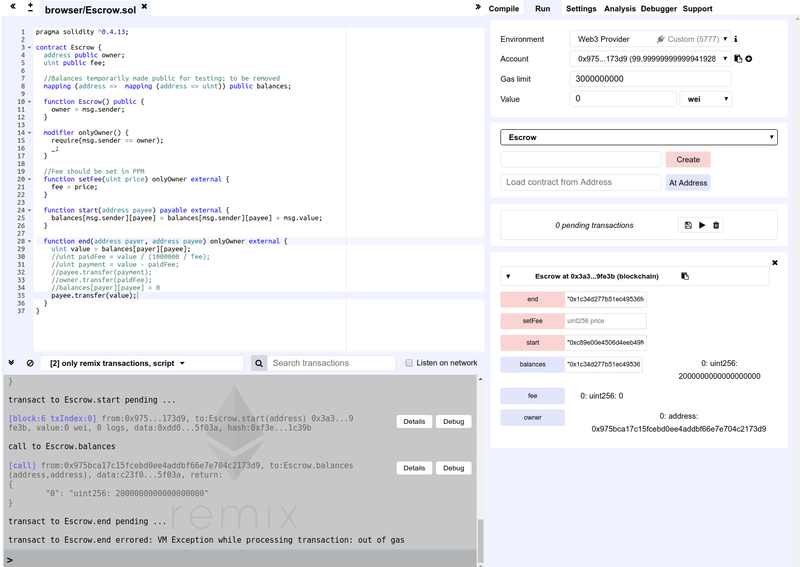 If I change end to just transfer 1 ETH to payee, I get a gas error. So I can't figure out what the source of this issue is. Can you give any advice? The code you pasted here works fine, except the forgotton ; at payee.transfer(value). My guess is that as the error says, you simply didn't provide enough gas. I think you need to add the from account in step 4, like you have in step 2 but without any value. Otherwise it doesn't know what account to charge for gas. You passed Value and now your value is stored on balances[msg.sender][payee] finally after adding. for the first time you transact this function then all your value is transferred to an address of payee. for the second time you transact this function then you have no value left then you get the vm error. If you have not did this mistake then check web3js. please pass optional parameter. options - Object (optional): The options used for calling. from - String (optional): The address the call “transaction” should be made from. gasPrice - String (optional): The gas price in wei to use for this call “transaction”. gas - Number (optional): The maximum gas provided for this call “transaction” (gas limit). Not the answer you're looking for? Browse other questions tagged solidity truffle remix mapping address.transfer or ask your own question. How to return a mapping type?